While mixing your own aromatherapy oils by using two or more essential oils, it is important to choose correctly to achieve a harmonious blend. There are certain essences which blend perfectly and can improve the overall effect. The correct choice of essential oils and the proper mixing of essential oils, to enhance the power of oils is called synergy. You will need a measuring spoon from a chemist or cooking store and a 30 ml of clean, brown glass bottles to mix your oils. Basically, each of your essential oils bottle has a dropper in the lid. So you don't have to buy a dropper again. But if it doesn't have one, it means you'll have to buy a new one. Make sure that you get enough droppers, one dropper for each essential oil. Don't use the same dropper for the all essential oils, you don't want to leave small residue in the dropper and that gets mixed with some other oil the next time you use it. Measure 20 ml (4 teaspoons) of carrier oil into a dark brown glass. Add up to 10 essential oils. Shake the mixture and leave it in a cool place. Make sure the bottle is tightly closed. Use it within 4 weeks. A 2.5% dilution is good for massage and general use. Tips: Instead of shaking it, you can roll the mixture between your hands vigorously to thoroughly mix the essential oils and carrier oil, or you can turn the bottle upside down. 5% dilution is more concentrated and usually applied in small areas for pain relief. 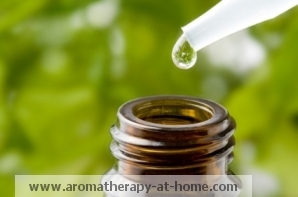 To make a 5 % dilution, mix 20 drops of essential oil with 20 ml of carrier oils. 1% dilution is good for children aged 3 to 10 and adult with sensitive skin or during pregnancy. To make a 1% dilution, you can mix 4 drops of essential oils with 20 ml of carrier oils. Wash your hand before and after the blending. Replace the caps of the essential oils bottle as soon as you finish counting the drops. Count the drops carefully as they are added to the bottle. See each of essential oils' profiles to make a harmonious blend.